Because of that, I try to take really good care of my hair so it grows in healthy and the hair that’s left is strong and looks good to fill in the gaps. 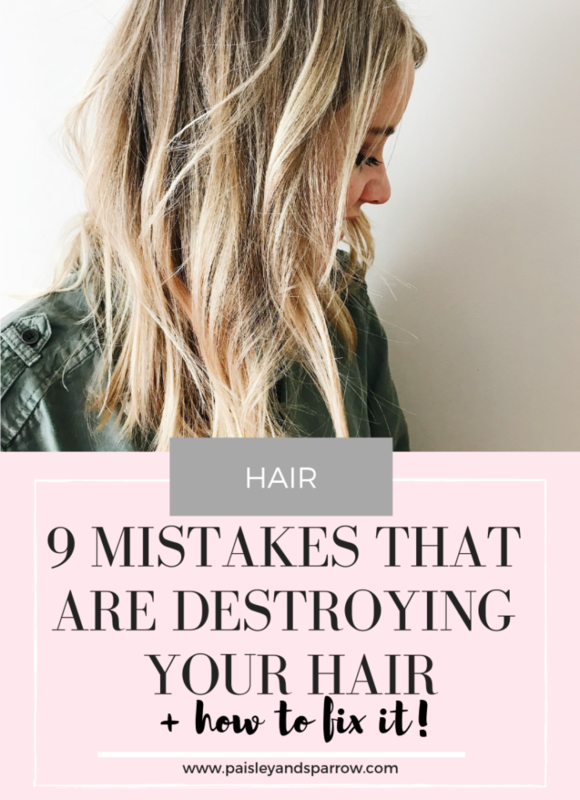 In case you are in a similar boat, or just want to have healthier hair, here are 9 mistakes that are destroying your hair and ways to fix it! This post may include affiliate links which means I may earn a small commission if you shop using the links below at no additional cost to you. Paisley + Sparrow is a participant in the Amazon Services LLC Associates Program, an affiliate advertising program designed to provide a means for sites to earn advertising fees by advertising and linking to Amazon.com. Thanks so much for supporting me and this blog! I’m sure we all know how bad blow drying your hair can be for your hair – especially if you do it every single day! Going after your entire head with your blow dryer rather than doing it section by section can also be problematic. Try to wash your hair every other day to eliminate half of the blow drying you currently do. This is my air dried hair look! I add a bit of dry shampoo (find all of my tips for using dry shampoo here) to give it some texture and volume. One thing I didn’t realize was how using cheap hair tools was affecting my hair. When your hair dryer isn’t very effective it causes you to use more heat for a longer period of time on your hair – thus drying it out and possibly damaging it even more. Same goes for your flat iron or curling iron. If heat isn’t distributed properly or it just doesn’t work as well, you’ll be forced to go over the same section numerous times to get it styled how you want. The least amount of heat on your hair the better! Invest in quality hair tools. This is something that may take some time because man, the good ones are not cheap! Keep an eye on sales and save your money – trust me when I say it’s worth it. What I use: I’ve been using this styling wand trio for almost a year now and it has changed my hair! It makes it so much easier to style and I literally only do each section once. I also use the same brand’s hair dryer – Costco sometimes has them for way less money so if you’re a member, check there first! This is a super common mistake that a lot of women make and even easier to fix! Heat protectants help add moisture to your hair which creates a protective layer for when you’re blow drying or styling with heat. Most heat protectants are actually dual purpose so they not only protect your hair from the heat but they also add shine, texture or volume! 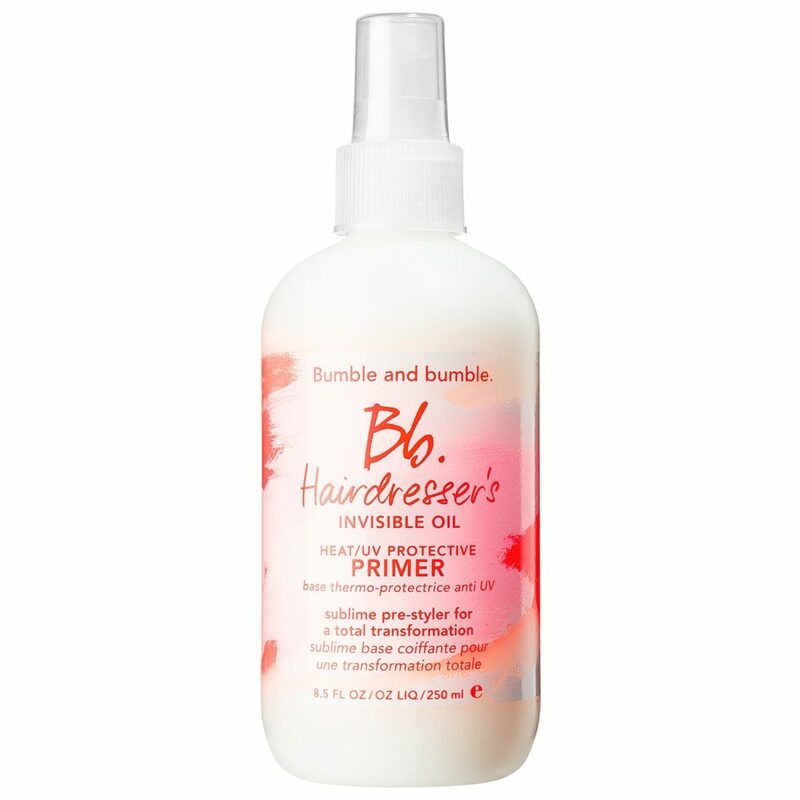 Pick up a heat protectant this is right for your hair and start using it! There are different options for using it on dry hair or wet hair – you may or may not need both! The life of a busy woman means lots of ponytails, am I right? I had a friend who used to wear ponytails all day and all night (literally!). When she went to her stylist for a cut, the stylist could tell exactly where she was wearing her ponytail because of all the breakage she was getting from it. Use scrunchies when possible. If you like to sleep with ponytails in, the least you could do is use a scrunchie (and don’t wrap it too tight!) to eliminate some of the friction. Opt for low, loose buns when you need to get it up. This is probably the number one thing my stylist (Jenna from Cajah Salon) says to me when I ask her how to get my hair to grow faster and be the healthiest it can be. Eating crappy food, not enough fruits and vegetables and not drinking enough diet will show itself in more places than just your waistline! Your hair, skin and nails will reflect what you put inside your body. Obviously eating a diet rich in vegetables, fruit, whole grains, etc is key to a healthy diet. Make sure you’re getting essential fatty acids (like omega-3s) which can be found in salmon, tuna, almonds, etc. Eat foods with Vitamins B6 (bananas, potatoes, spinach), B12 (meat, fish, dairy) and folic acid (fresh fruits and vegetables, whole grain, beans). Also lean meats (fish, chicken, eggs and soy) are also needed for healthy hair. If this seems too daunting, start with one section at a time. Add in the foods in that section and then add in the next and the next! I am 100% guilty of this. Hot water for your hair and body is not good. 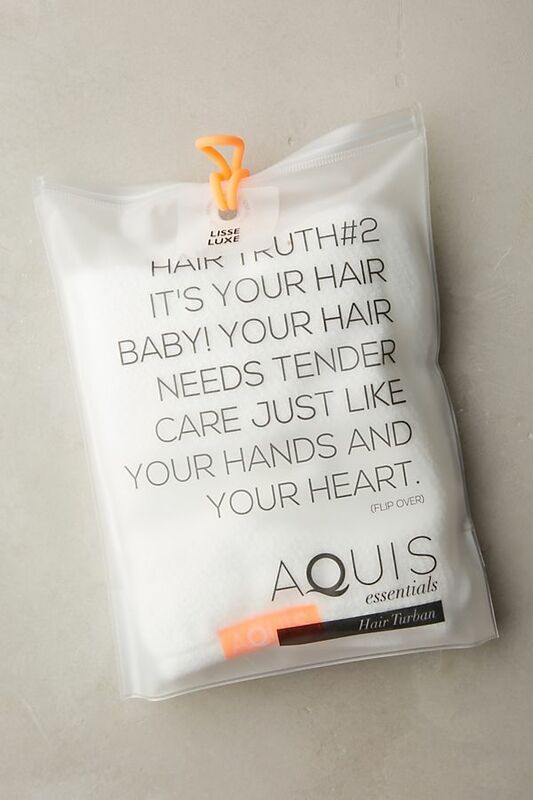 It can dry it out and make it more prone to breakage – exactly what we’re trying to prevent! This one’s easy – turn down that water temp! I know it’s hard to do but make a conscious effort to turn it down, even a little bit! Wet hair is much more vulnerable than dry hair so be careful! Pulling a brush through wet hair to break it apart can cause a lot of damage. Use a wide tooth comb (something as simple as this will do) or Wet Brush when your hair is wet. If your hair gets really tangly, use the comb in the shower to work the conditioner through your hair. This can help release tangles easier. Did you know there’s product out there for pretty much every single type of hair and hair need? So if you have thick, straight hair you probably don’t need to be using hair for fine, wavy hair. Using the wrong product will cause your hair to not look it’s best and often times be as healthy as it could be. Talk to your hair stylist about what they recommend! They are the professionals and get trained in on all different kinds of brands and products. I ask my stylist every time I see her about what new product I should be using. Your hair needs can change depending on weather, diet, how often you’re styling it, etc. so your stylist should be able to recommend if you need to add a hair mask, volumizing spray or whatever! 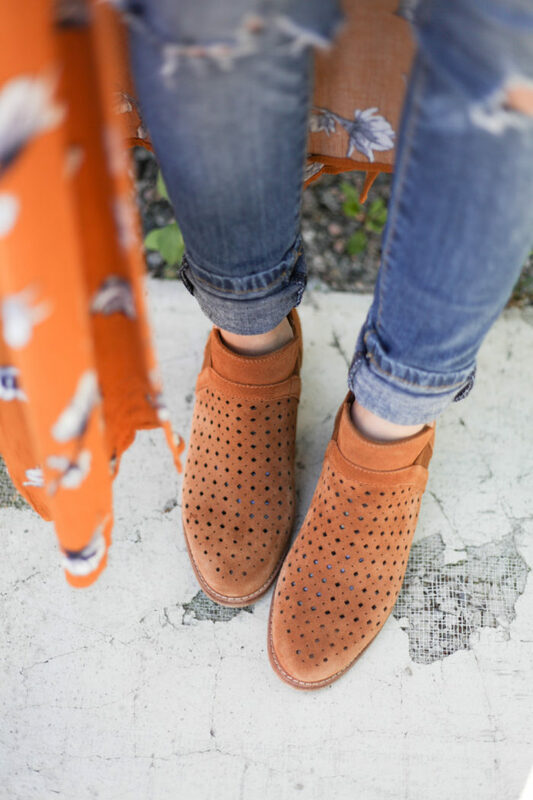 One thing to note – be cautious if your stylist is constantly trying to sell you tons of new product every time you see them. Jenna is awesome about seeing what I’m currently using and only adding something I really need rather than just up-selling me on the latest and greatest. She makes sure I use up what I bought before recommending a different product that does a similar thing. That’s the type of stylist you need in your life! I did this for oh, about 34 years. I literally just bought a new towel and it has been the BEST. 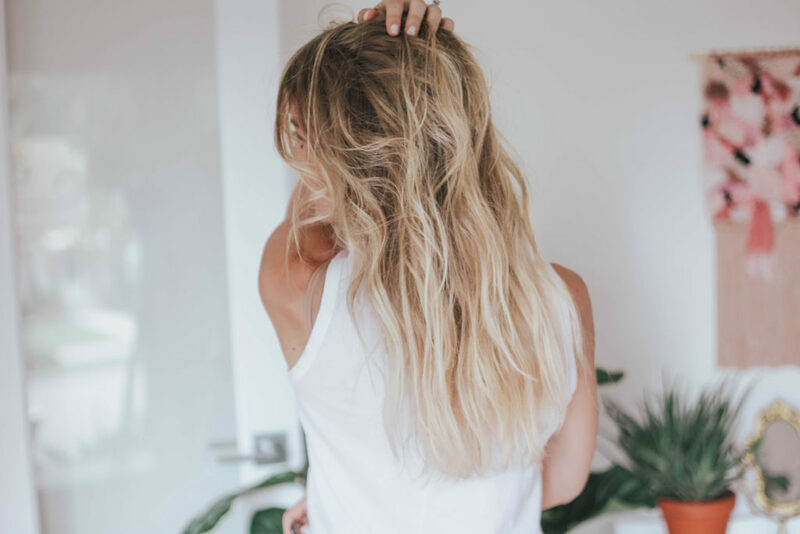 Using a typical bath towel and scrubbing your hair with it can cause a ton of damage and breakage (aka not ideal especially for those of us with postpartum hair!). Using a soft towel and gently pressing it rather than scrubbing it will do wonders. Get a soft, hair-specific towel and get in the habit of pressing, not scrubbing! What I use: I picked up this hair turban and it has been a game changer! Not only does it dry my hair better but it allows me to wrap it up without causing additional damage. At only $30, I highly recommend. I’m sure we have all done or are still doing a number of these mistakes that are destroying your hair! I hope this helps you to be well on your way to fixing them and having a fabulous hair day every day! Now go check out all of my tips for using dry shampoo! I bet you’ll learn a thing or two!